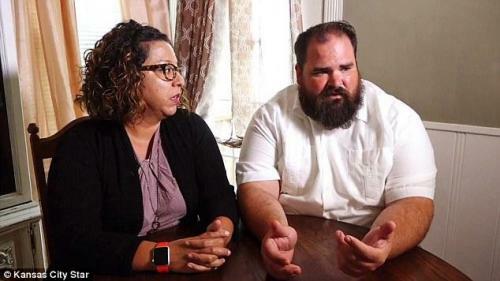 An American-born Kansas family had their bank account frozen after Bank of America demanded to know their citizenship status, reports the Kansas City Star. Josh Collins of Roeland Park, Kansas ignored a letter from the bank asking a variety of personal questions, including whether he was an American citizen or holds dual citizenship with another country. Josh was born in Wichita, Kansas, while his wife Jessica Salazar Collins was born and raised in Kansas City, Missouri and is a second generation American citizen whose great-grandfather immigrated from Mexico. Jessica said she tossed the letter out because she and Josh “thought it was a scam,” since Josh had been banking with BofA for the past 20 years. On July 24, however, Bank of America froze the Collins’ account – preventing them from accessing cash. BofA said that it’s standard practice to ask about citizenship status when opening a new account or updating customer information. Except citizenship questions are not federally required according to the California Banker’s Association – the largest state affiliate of the national group. “Not to our knowledge,” said spokeswoman Beth Mills, who added that federal law requires banks must collect and verify just four things about account holders; name, date of birth, address and Social Security number. Bank of America spokeswoman Diane Wagner blamed the Collins family for failing to return the questionnaire. “If we don’t hear from a customer in response to our outreach,” she said, “as a last resort, we may restrict the account until we can confirm it is in compliance with regulatory requirements.” Collins wasn’t chosen for any specific reason, according to Wagner. Will Rasmea Odeh’s Appeal Expose Israeli Prison Torture In A US Court?